New Hampshire’s White Mountains once featured 30 grand hotels offering elegant summer living to guests escaping city heat, reaching a heyday in the late 19th and early 20th centuries. The hotels were all set in stunning mountain landscapes, attracting visitors who would arrive by train and motorcar to stay for weeks or the entire summer season. And then, one by one, ravaged by time and changing tastes in how and where families vacationed, many of these spectacular buildings fell victim to decay and fire. 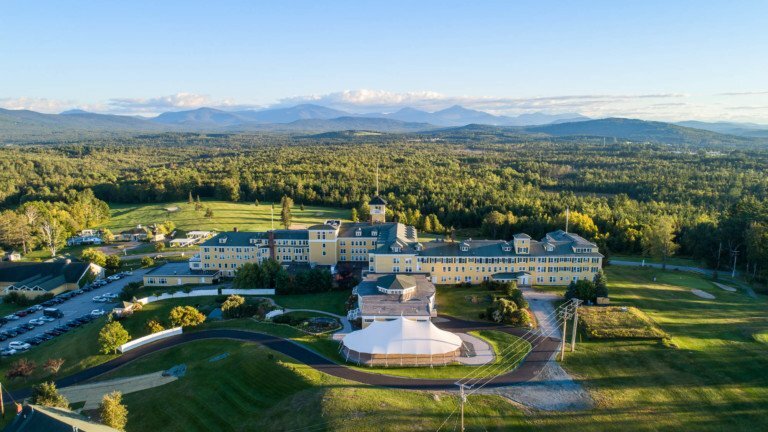 Today, the list of century-old resorts in New Hampshire’s North Country is down to a few, most notably in the North Country The Omni Mount Washington Hotel in Bretton Woods and the Mountain View Grand Resort in Whitefield. Both built more than a century ago, each has had its ups and downs, but both are still important contributors to the region’s economy. The Mount Washington Hotel, with 1,000 employees in winter and 600 in summer, is the largest employer in Coos County. Now known as the Omni Mount Washington Hotel in Bretton Woods, that hotel was saved by the Presby and Bedor families, local business people who sold it to a larger organization to make the necessary investment to keep it going. While the Legislature mulls House Bill 540, a measure that would help move the redevelopment of the Balsams in Dixville Notch forward, some North Country leaders say you don’t have to look far to find a similar example of a hotel renaissance that succeeded. Take the example of the Mountain View Grand Resort in Whitefield, a resort that attracted celebrities and presidents, expanded under the guidance of four generations of the same family, then closed in 1986 after several buyers could not duplicate the winning formula that had kept it alive. For this grand resort to be reborn, the state of New Hampshire provided valuable help. Kevin Craffey, a contractor from Duxbury, Mass., was looking for a summer house when he came upon an ad for the Mountain View Grand Hotel in Whitefield. Shuttered for 12 years, the summer resort hotel, including 360 acres, 200-plus rooms and nine-hole golf course, was eventually sold to him for $1.3 million in 1998. He and his wife decided to rebuild the structure. The original log home and 16-room addition, which opened for business in 1866 by the Dodge family, was razed, improved and expanded over the years. It became the destination resort that hosted Presidents Warren G. Harding, Dwight D. Eisenhower, Richard Nixon, and Ronald Reagan, as well as astronaut Neil Armstrong, and stars Bette Davis, Groucho Marx and Babe Ruth. Problem was Craffey could not find a bank to lend him the money. He turned to state government for help, according to the resort’s website. According to the resort’s history, a $1 million loan and grant from the New Hampshire Department of Resources and Economic Development, sale of $2 million tax credits arranged for by the New Hampshire Community Development Finance Authority and help from then-Gov. Jeanne Shaheen in arranging for additional loans from three New Hampshire banks all resulted in the historic Mountain View Grand being reopened in May 2002. “It was a miracle. It sat there empty for 10 years,” said Rep. Edith Tucker, D-Randolph, who along with Berlin state Rep. Henry Noel, introduced HB 540. The measure creates a financing tool to help the project move forward but doesn’t put the county at risk if the project fails, Tucker said. It passed the House by a wide margin and must still go before the Senate. Craffey’s redevelopment wasn’t without missteps. He was convicted of illegally dumping asbestos removed from the hotel during renovations. In a plea agreement, Craffey was fined and ordered to serve two months in jail, according to The Conway Daily Sun. The hotel was sold to American Financial Group and is thriving today. The resort employs 250 people in the summer, Tucker said. “We are so lucky to have this hotel in our town,” said Judy Ramsdell, administrative assistant for the town of Whitefield. In addition to providing jobs for many, along with the significant taxes, it adds life and vitality back to the community, she said. “It’s a real family place and people come back year after year,” Ramsdell said. In addition to a thriving conference business, the hotel specializes in weddings. Tucker said many in the North Country are optimistic that the success seen in Whitefield and in Carroll can be replicated at the Balsams. “The Balsams is being designed to appeal to today’s tourists who enthusiastically enjoy outdoor recreation, including a spa, fat bike trails, an outside marketplace and trail running. The Balsams’ beauty and diversity of its offerings would lure visitors into the Great North Woods,” Tucker said. Tucker said construction and hospitality jobs at the Balsams would be created at a large enough scale to help support families in what are now shrinking communities. “I really want this to happen,” Tucker said. This article has been published jointly by NH Business Review and IndepthNH.org, New Hampshire’s nonprofit news website published online by the NH Center for Public Interest.